Okay, so maybe it’s not so much trouble as obsession that’s gotten out of hand, but I like alliteration. 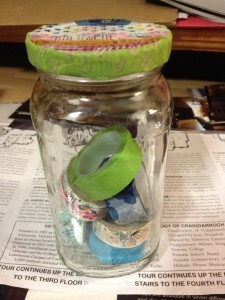 As you know from reading this blog, I’m a crafter. And not just one kind of crafter, ohhhh nooooo that would be too easy. I don’t just have a yarn stash. Or an embroidery stash. Or an art supplies stash. Heck, I even have an adult coloring stash. 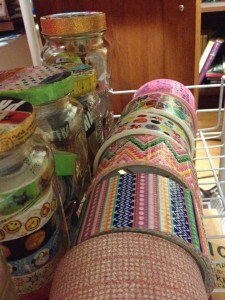 And I have paper craft stashes of all types, from stickers and lettering sets to stamps and washi tape. Ah yes, washi tape. That’s the newest little obsession I have and I keep telling myself I have to stop. And some pretty duct tape too, which is useful as well as being decorative. 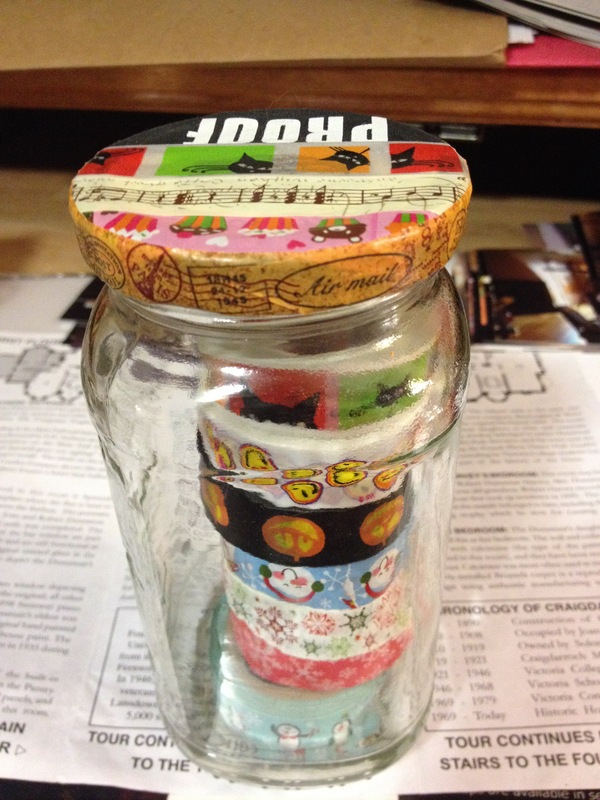 Not that washi tape isn’t useful; I use it constantly, as borders in a scrapbook, or to adhere ticket stubs in travel journals, or to accent pages in an altered book. 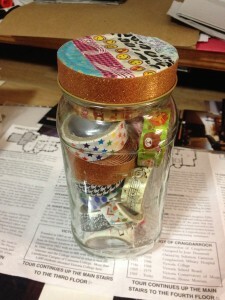 I use it to decorate things, too, like envelopes I’m mailing gifts in or to add seasonal impact to edges of a serving plate or to beautify any little thing, like the lids of the very jars I store my washi tapes in. I started with just one jar. Just a simple jar of miscellaneous tapes. I’d found some at scrapbooking shops and stationers. 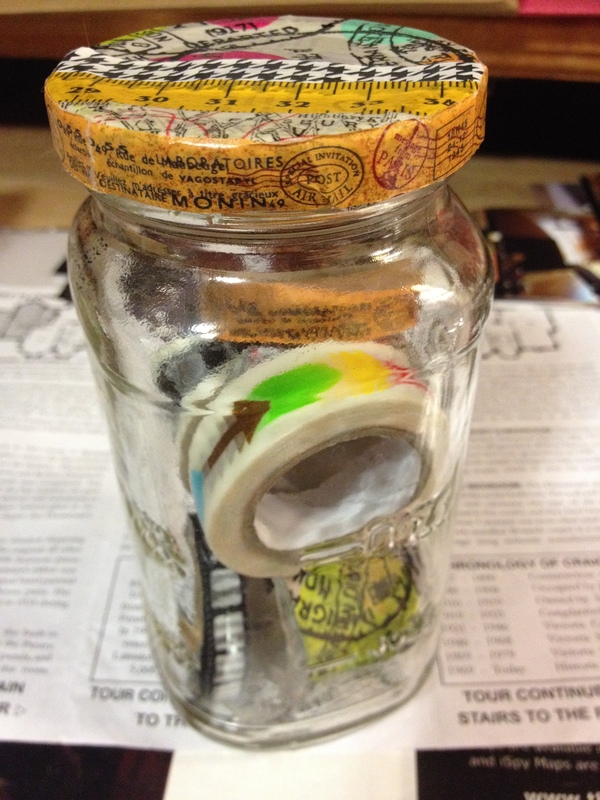 I liked them for travel journals and so soon I had a second jar, just for travel-related tapes. To make things easier, you know. I carry a pencil case with me when travelling, with pens for notes and a glue stick and a few rolls of washi tape. Because, well, you never know when inspiration will strike. And this made it easier to sort out which tapes to tuck in with me when I was headed out on a trip. I’d discovered others on Etsy and Amazon. So many pretty tapes! Then suddenly they were mainstream, and I found them at the dollar store and Walmart. 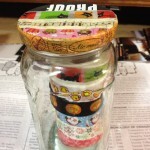 I added a jar for floral tapes. 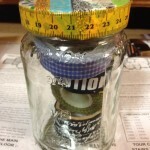 And a jar for label tapes. 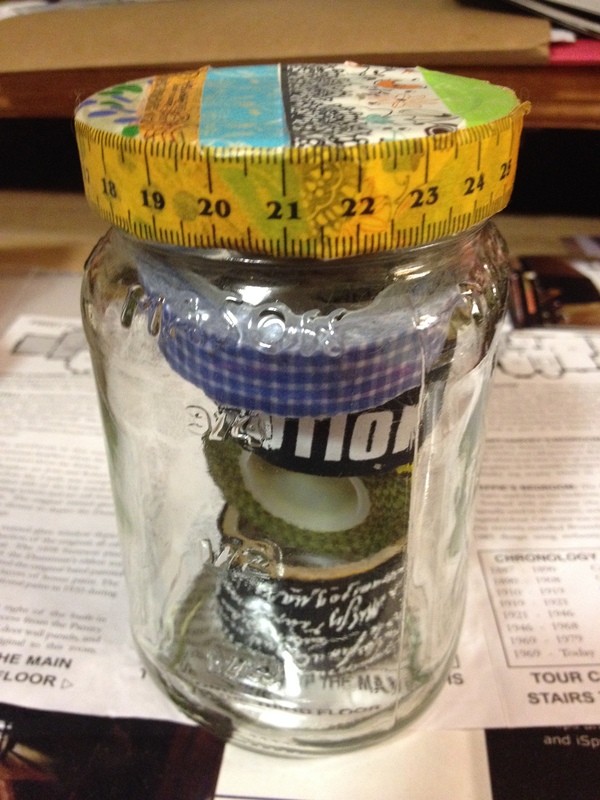 And then I needed a whole other jar for holiday and seasonal tapes. My main jar is getting full again; I’m not sure what the next category will be, but I’ve a feeling I should plan another pasta dinner soonish. One that doesn’t involve home made sauce and will slightly disappoint my husband, but will provide me with more invaluable storage space. 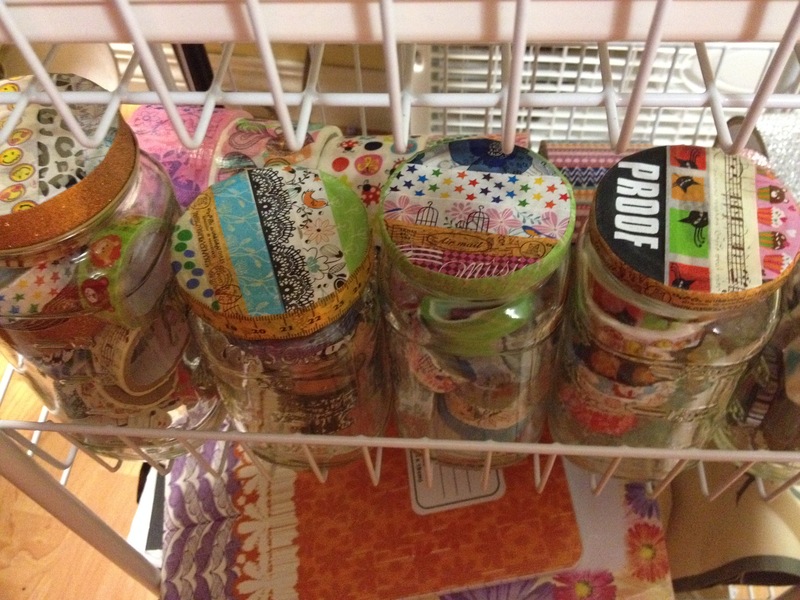 Right now, the jars live on a little wire, wheeled cart that sits next to my crafting armoire. The armoire is a re-purposed computer armoire that holds most of my paper crafting supplies, as well as (hidden away in the back on the bottom) my sewing machine and sewing supplies. The cart, on the other hand, holds my tapes in the middle bin, ephemera I’ve been collecting for various purposes in the bottom binn (and anything else I don’t have a home for, hah! ), and Project Life materials (a type of scrapbooking) in the top bin, as well as matts and a few other scrapbooking and journaling things. 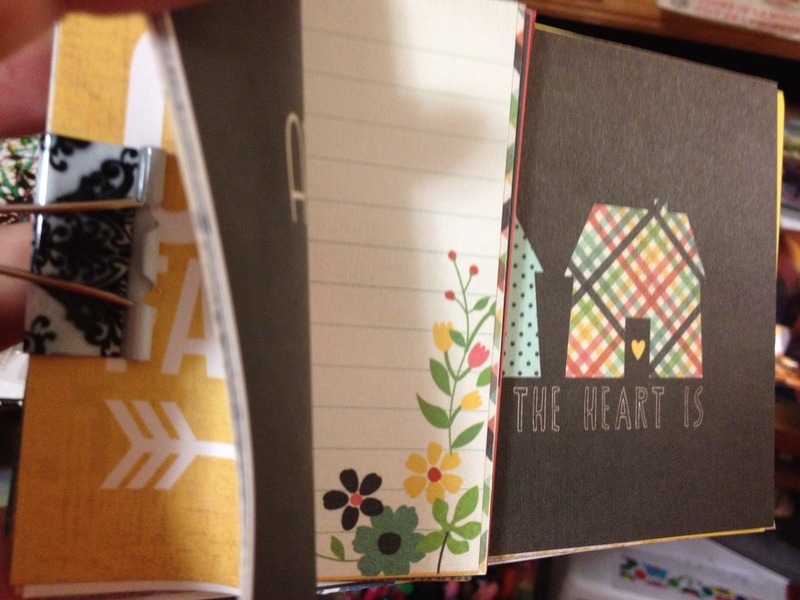 I should technically call this “Pocket Scrapbooking” as that’s the overall term, and I have products from various lines, as well as many many cards I’ve designed and printed myself for my use. 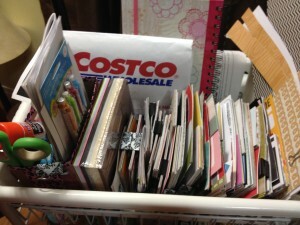 I love the Project Life brand binders and page protectors, but I don’t use many of their cards. But others? Oh my… I’ve so many that I spent a long time looking at the ways in which various people organize their supplies in order to come up with a solution that would really work for me, and let me find what I’m looking for quickly and easily. And you know what that turned out to be? Binder clips! Yep, just cheap ones from the dollar store, mid sized. I split my cards into sets – either purchased together, or themed from the same line, or ones that I’ve made that connect color -wise and thematically. Then I can just shuffle through the binder clipped sets til I find the one I’m looking for, I have maybe four dozen, and easily flip through the contents of the set to see if it has what I’m looking for, without fumbling cards all over the place. I’ve dumped a whole box before from trying to use someone else’s filing system for these cards. It’s a good thing I like organizing stuff, because it took me a good three or four hours to put everything back together again! 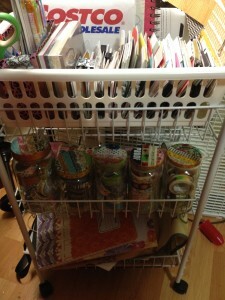 I also don’t have to make filing labels, which seems time-consuming (and what the heck do I label things? Card set number four that is pretty but has no practical purpose? Card set number four about flowers?) but is the basis of a lot of pocket scrapbooking organization. And when I’ve used up all the cards in a set, I can re-use the binder clip for a new one. This sort of keeps my buying in check, as I’ve promised myself that I can’t have more sets than I have clips, and right now I only have one free clip. Gulp.